Here at Plecto, we advocate for the effectiveness of sales contests in improving employee engagement and driving performance. Our customers regularly implement sales competitions and games with great results. There is also research backing up the power of friendly competition and the positive effects it has on motivation, effort and achievement. We find that sports-themed sales contests, in particular, are a great tool for our customers because of the familiarity and the excitement of them that every employee can relate to. We want you to experience the power of sales contests too. In this blog post, we will speak about four different sports-themed sales contest you can get started with using today and also show you how you can create dashboards for each sales contest we speak about! 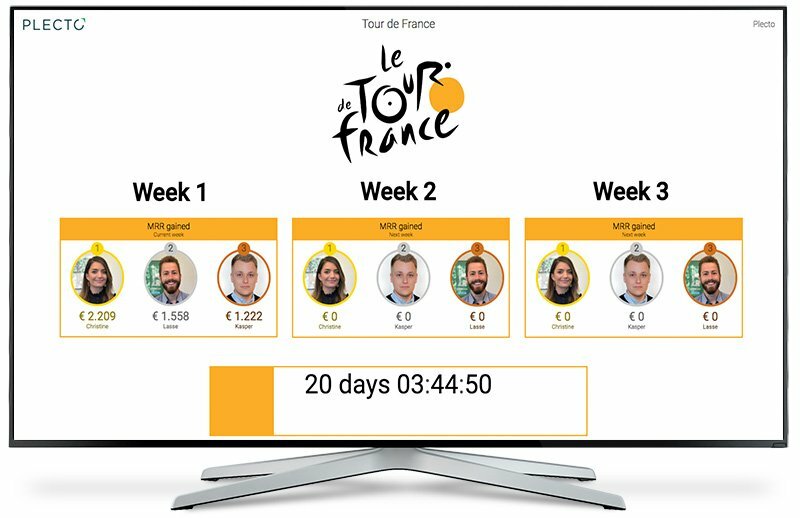 Creating a Tour de France style sales contest is extremely easy, both to implement and create a dashboard for. This is a contest we are currently running at Plecto and it's working great! How do I create the contest? The first thing you have to do is decide on how long you want each 'stage' or section of the competition to be. For example, in the actual Tour de France there is an overall winner but also a winner from each stage of the competition. Here at Plecto, we have chosen to run the contest on a weekly basis in which the winner of each week gets a prize. How do I create the dashboard? Below you can see an example of how your Tour de France dashboard could look. It was created by using leaderboard widgets that display how much MRR (monthly recurring revenue) each team member has made so far this week. The countdown bar isn't an essential part of the dashboard but it is a nice way to visualise how long is left of the overall competition! Alternatively, you could place images showing what the prize is for each week. This contest requires a little more organisation to implement, but the enjoyment your team will get out of it is worth it. If you're familiar with basketball, then you already know the structure of March Madness. If not, it basically involves splitting NBA teams into one of four brackets, based on location. Teams within the same bracket play against each other on a knockout basis, until there is an overall winner from each bracket. Teams from different brackets then face each other until there is one overall champion. This contest works best for large companies, especially those that have offices in different locations. Whatever size your business is, you need to make sure you end up with four brackets overall. Establish the KPI you want to measure your salespeople by and what the requirement is for winning the contest. Is it making five sales first? Is it the number of sales made in a week? Decide on this and then you are ready to begin setting up the one-on-one competitions. Below you can see an example of a 'first round' March Madness dashboard. It looks a little complex but it's actually really simple to create. We have envisioned a company that has four locations: Copenhagen, London, Stockholm and Frankfurt. This company has four salespeople in each location. Before you begin creating the dashboard you need to do a little bit of behind-the-scenes work. All you need to do is create teams (e.g. Team Copenhagen) and then two sub-teams in each team (e.g. Team Copenhagen 1) containing the two employees who will be competing against each other. In the case of this company, Team Copenhagen is comprised of Christine, Kasper, Lasse and Jens. Team Copenhagen 1 contains Christine and Kasper and Team Copenhagen 2 contains Lasse and Jens. You can then create leaderboard widgets grouped by these sub-teams. 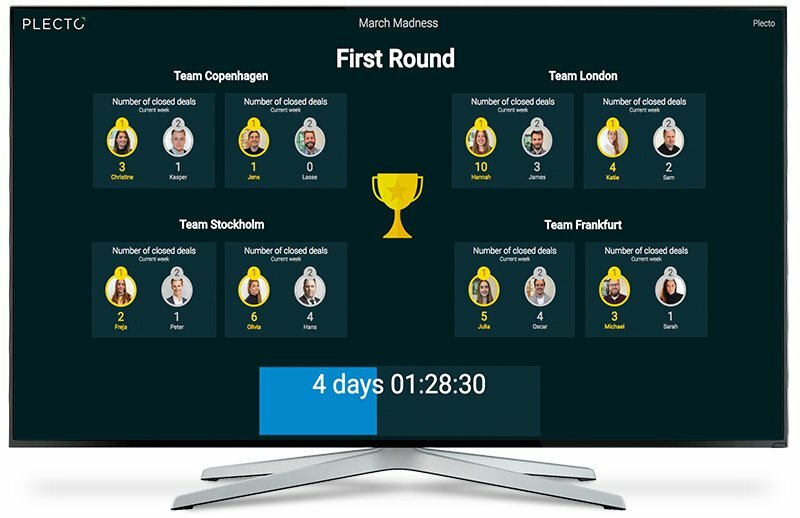 At the bottom of the dashboard, you can see a countdown widget which is a great way for your team to instantly know how much time they have left to win their one-on-one contest. When it comes to your final round, we have also created a dashboard to show how this could look. 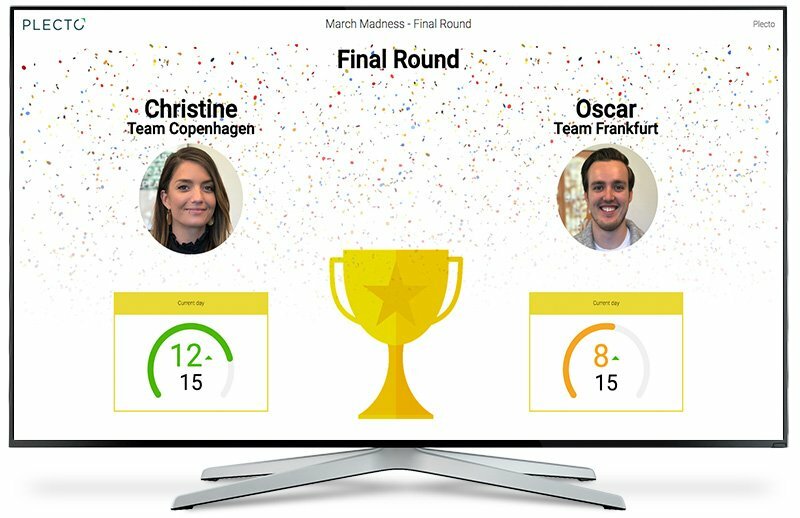 This dashboard was created simply by using image widgets to put in the sales team members' photos, and by using speedometers to show the progress of the two finalists against their goal. 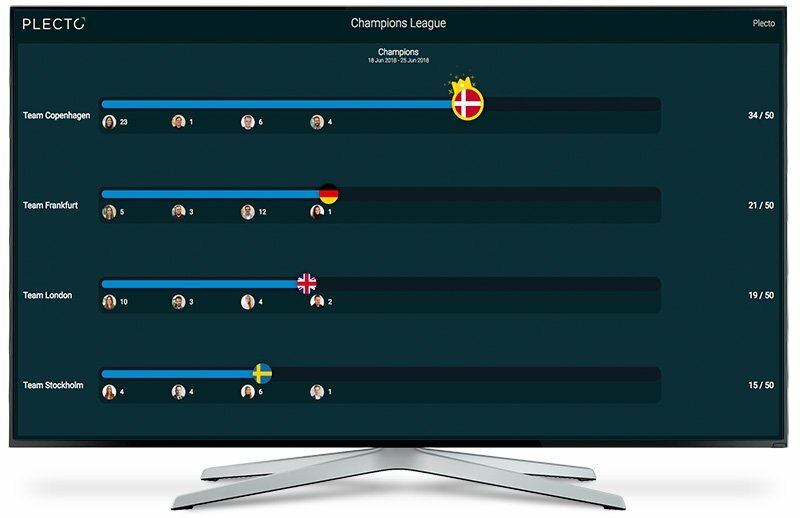 You could then set up a notification alerting you of the winner that will trigger once either finalist reaches the goal. This contest is super simple and perfect for large companies. You split your sales department up into teams who then compete against each other. This kind of contest is perfect for improving team relations and also for bringing together large sales teams. If you are a multi-location business, then you can also split locations into teams and create a company-wide friendly competition. All you have to do to set up this contest is split your sales team into sub-teams. Whether you let them choose their teams or assign them randomly is up to you. Set the KPI you will be measuring them on and establish a time frame. Then you're good to go! This dashboard can easily be created by simply using a leaderboard widget arranged by teams, or by creating a Plecto sales contest dashboard grouped by teams. 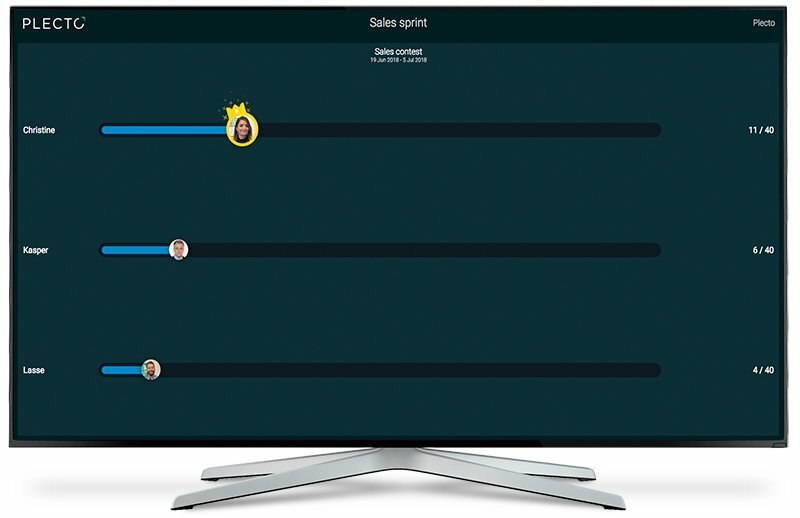 Below you can see what a sales contest created using the Plecto contests feature would look like, based on four teams. This is probably the easiest contest of all to set up as all you need to do is decide on the goal you want your employees to reach. Is it a certain number of calls? Closed deals? Opportunities created? Set a goal, the first one to reach it wins! Plecto gives you the ability to easily start a sprint sales contest and the dashboard will be automatically generated for you based on the data you put in. You simply need to assign which employees you want to compete and set the goal. Below you can see an example of what a Plecto sales contest dashboard looks like. Each employees' progression along the bar happens automatically, allowing you to see real-time results. This is great for their engagement and excitement levels! Want to get started with creating sales contests and boosting your team's performance and engagement? Sign up for a 14-day free trial of Plecto and begin a sales contest today!